This entry was posted on Wednesday, November 16th, 2011 at 11:29 AM	and tagged with Adolescence, BBYO, God, Habonim Dror, Jewish Teen Education, Jewish Teens, Judaism, Religion and Spirituality, supplementary Jewish high school, supplementary school teachers, youth engagement and posted in Jewish Community, Jewish Education, Jewish Educators, Jewish Teens, Judaism, Synagogue, Teens. You can follow any responses to this entry through the RSS 2.0 feed. I agree. If teachers have their own unresolved issues, they’re may find it difficult to open these areas for discussion, yet so often those conversations are what makes the educational experience so meaningful. 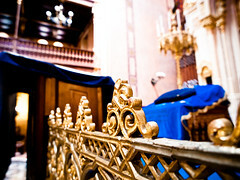 Permission for teens to be part of whatever Judaism they can connect to, does seem important especially during a time of life where spiritual doubt is very common.But I do think that the spiritual “challenges” that teens express sometimes make it easier for educators to avoid the spiritual discussions rather than address them in dialogue.